Games between the Pittsburgh Penguins and Philadelphia Flyers are typically hard-fought contests regardless of where the two teams are in the standings, and it'll certainly be a heated game with a huge two points on the line. The Flyers are just a single point behind the Detroit Red Wings for the final playoff spot in the Eastern Conference, and they're 4 points behind the Penguins with a game in hand. They'll be looking to continue their hot run (8-1-1 in their last 10) to catch the teams in front of them, while the Penguins will also have an eye ahead in the standings. Pittsburgh is on a run of their own, having won 4 straight, and they will enter the game just 1 point back from the Islanders and 4 points behind the Rangers in the Metropolitan Division. They'll try to catch the New York teams while also padding their lead over Philadelphia. It's just the 2nd of 4 games between the teams this season, with the Penguins winning 4-3 in January. The Flyers started off the year slowly after a disappointing 2014-15 campaign that saw them miss the playoffs with 84 points, but they've surged up the standings during the second half of the season and were momentarily in the playoff picture before being passed again by Detroit. Brayden Schenn has played a big role in their recent streak with 6 goals and 6 assists in his last 10 games played. Schenn has set career highs so far this season with 24 goals and 48 points through 67 games and has now scored more points than his previous year each season that he's been in the league.It couldn't be better timing for the pending restricted free agent as he's likely to surpass his current $2.5 million AAV on his next contract. But while Schenn has taken a step forward this season, another Flyer has taken a giant step back. Jakub Voracek earned a monster 8 year, $66 million contract in the offseason after posting a career high 81 points in 2014-15, but he's been largely disappointing in the final year before his new contract kicks in. Voracek has scored 10 goals with 38 assists through 60 games this season, and he's on pace for his fewest goals since his rookie season. He's still 3rd on the team in scoring, but much more was expected from a player who will count $8.25 million against the cap in upcoming seasons. It's another player with a large cap hit, Claude Giroux at $8.275 million, who leads Philadelphia with 18 goals and 41 assists. 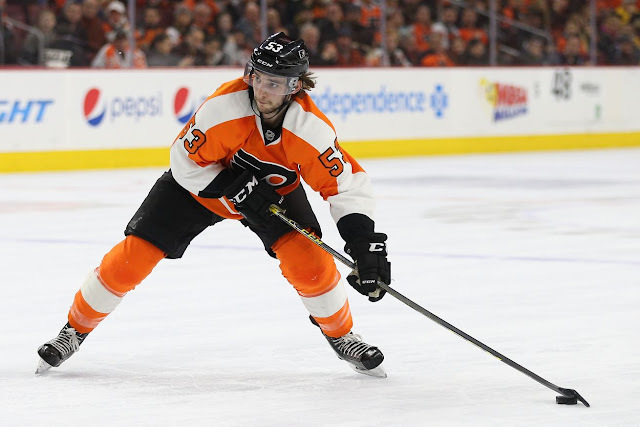 It's a far cry from the "best player in the world" status that the Philly media desperately wanted to bestow on him, but he continues to be an effective player for the Flyers. But the biggest surprise for the Flyers hasn't been a veteran, but a rookie who's come in and taken the league by storm. Shayne Gotisbehere has had a stellar season that has firmly vaulted him into the Calder Trophy discussion. Through 51 games played, Gotisbehere is 5th in the league among defensemen with 16 goals, and his 39 points place him 5th on the team in scoring. Though he doesn't have prototypical size on the blueline (5'11", 186 lbs), he's displayed a great amount of offensive talent on the back end and has managed to come up big in big situations, with 5 game winning goals and 20 power play points. He has all the earmarks of a 3rd round steal for Philadelphia and should have a place on their defense for many years to come. It's been a timeshare in net for the Flyers this season, and Michal Neuvirth (0.925 SV%, 2.28 GAA) has had a noticeable advantage in production over Steve Mason (0.925 SV%, 2.61 GAA), though Mason leads in games started 41 to 28. Mason has had several high points over his career, including a Calder Trophy win and Vezina Trophy nomination in 2008-09 with Columbus and a stellar bounce back season last year with a 0.928 SV% and 2.25 GAA, but he's shown that between the highs he's had large periods of below average to mediocre play. - With a point against the Flyers, Sidney Crosby would match the 11 game point streak he recorded earlier in the season. However, with 16 points on his current 10 game scoring streak, Crosby would need a career night to match the 22 points he recorded over the previous streak. - The Penguins have demoted Dominik Simon to Wilkes-Barre and have recalled Oskar Sundqvist.